Commodities rout is one of the key themes that have characterised 2015. Further to oil and gold (which we covered last week http://www.bsic.it/future-gold-full-hedge-role-risk/), several basic resources, like industrial metals, have been suffering for months, but they may be affected by slightly different factors than the former. Through this article, we aim at understanding both fundamental and statistical dynamics that have driven prices of these commodities recently, trying to provide some outlook and trade ideas as well. Let us start from a fundamental, macroeconomic-led overview of the causes. Chinese economy slowdown has heavily affected the industrial metals markets. Indeed, the deceleration of the major user of base metals, coupled with a copious supply, has depressed their prices. The decrease in demand was also triggered by the beginning of China’s transition to become a domestic demand driven economy, from being an export and investment driven country. The most traded industrial metal, copper, is going through a complex situation, which is quite descriptive of other metals as well. The bearish sentiment is caused by oversupplied market and weak demand from China, combined with a constantly stronger USD (which makes it more expensive for non-US players to buy USD-denominated commodities). 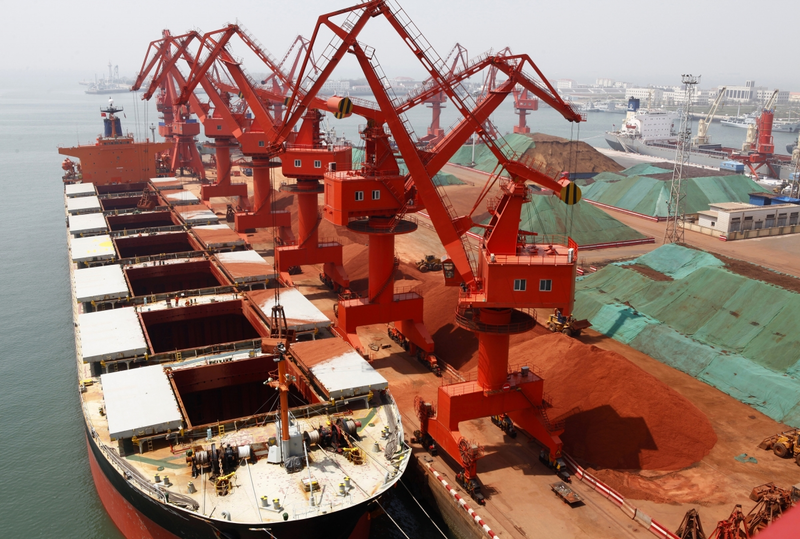 Analysts estimate that China accounts for roughly half of global copper consumption. On the other side, producers are behaving in a not-completely-rational way: instead of cutting output, they are optimising costs. Currently, roughly 20% of copper production is estimated to be loss making. Output cut seems a current topic with regard to nickel, as prices rebounded on rumours on Thursday on Asian markets. Nonetheless, most analysts believe that this will not be sufficient to boost the metal’s prices, as demand remains really weak. Approximately 50% (but, according to some, the figure reaches 75%!) of nickel production is not profitable at current market prices. Plunging industrial metals prices are clearly affecting the corporations that deal with them. ArcelorMittal, a multinational steel and mining conglomerate, recently lowered its guidance for the next years. Mining and basic materials companies listed on the London Stock Exchange have plunged for months; Glencore is probably the most famous example (its shares are down ~40% ytd). Finally, while some firms in the industry have used capital markets to (try to) improve their balance sheet (by either raising cash or selling assets), other players have actually chosen to postpone their approach to the financial marketplace, citing low prices as a concern (and a disadvantage). One recent case is Vale, the Brazilian conglomerate. The situation is not optimistic for industrial metals, and it seems that factors different than a new, unlikely Chinese acceleration will not be able to drive prices up in a sustainable way in the long-term. Indeed, although other economic areas (e.g. EU with a stimulus package focused on infrastructure projects) or uses different than construction industry (e.g. smaller appliances) may expand their respective demand of base metals, this is not deemed to be enough to fill the growing gap between increasing outputs and lagging Chinese demand. Moreover, once the Fed will eventually reveal its expected rate hike path, the impact on prices may be even more marked. On the other side, however, it is important to notice that there are also some commodities that would likely benefit from Chinese economy becoming internal demand driven. For example, consumption of gasoline and heating oil has been growing strongly in the Chinese market this year. In addition, an increase in spending by wealthier Chinese consumers would also benefit soft commodities such as coffee, cocoa, wheat and other agricultural products linked to the food industry. In particular, we would like to focus our attention on soft commodities. These are partly affected by the same factors that influence metals and oil: USD strength, supply and demand balance, and global growth are the main drivers. Further to that, however, specific restrictive export policies applied by some countries, exposure to weather changes and natural diseases (which may affect the supply side), and increasing demand from developing countries play a significant role on individual cases. Let us remember, for example, the huge price movement of wheat during the summer of 2010 that was caused by the severe weather conditions (“Russian wildfires”) in Russia. These particular features are likely to provide us with some material for a trade idea. That said, in order to have a clearer view from a trading standpoint, we decided to run some basic correlation analyses. Our sample includes some industrial metals (copper, aluminium, nickel, and zinc), gold, and some soft commodities (coffee, sugar, and wheat). Further to understanding the relationship between each commodity, we also investigated the correlation with the Chinese stock index. Our sample of industrial metals actually seems exposed to similar factors, with pair correlation among aluminium, copper, nickel and zinc ranging between 0.54 and 0.72. This is, of course, consistent with the fact that they are exposed to similar drivers. 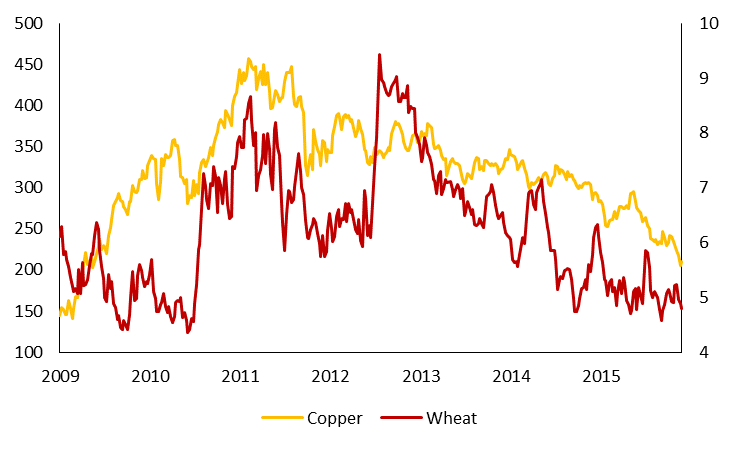 Correlation is not that high among the other commodities we analysed. Coffee, sugar and wheat display values (among themselves) between 0.15 and 0.30, thus showing that they are more affected by product-specific conditions. Moreover, their correlation with the metals mentioned before is even lower, being 0.20 on average. Correlation with gold is very limited for all the basic materials of the analysis, being 0.10 at maximum. Finally, correlation with USD is significantly more negative for the sample of industrial metals (around -0.40) than for what concerns soft commodities (slightly lower than -0.20). Still, all the commodities that we mentioned are down year to date! Therefore, we feel comfortable saying that USD strength is playing a crucial role currently. Furthermore, it is also relevant to recognise that they have mainly followed similar trends (but we know that charts may be misleading sometimes). What about China? Industrial metals show a relevant correlation with the Chinese benchmark (0.42 on average), while soft commodities are close to the value of zero. Of course, this makes sense and is consistent with the fundamental analysis explained in the first part of the article. So, how could we trade this situation? Given what we stated about a possible increase of soft commodities consumption in China, it may be good to take a long-hedged position on it. Therefore, we suggest going long a basket of soft commodities, while shorting a basket of industrial metals. This trade gives exposure to our fundamental view of increasing agricultural commodities consumption, and it protects from a further reduction of global material prices (assuming that USD strength will still be one of the main drivers). Furthermore, the use of baskets (instead of individual commodities) allows us to take advantage of the lower correlation that exists between soft commodities, and soft commodities versus base metals. Indeed, although coffee, wheat & co. are highly volatile on their own, we highlighted that they show low correlation values. Finally, we are not taking any clear view on Chinese stock market, while we are playing on our fundamental outlook regarding the shift towards the consumer-led model.